Anyone who’s ever bought a car knows the “sticker price” doesn’t tell the whole story. As it turns out, this same notion applies to the state’s costs for Medi-Cal, California’s Medicaid program and a key source of health care coverage for millions of low-income Californians. As we noted last month, the Governor’s proposed budget highlights the state’s sticker price for providing services to low-income Californians who enroll in Medi-Cal due to the implementation of federal health care reform. State analysts project that California will spend a bit more than $2 billion over two fiscal years — 2014-15 and 2015-16, which begins July 1 — to support health care services for Californians who have signed up for Medi-Cal due to changes associated with the federal Patient Protection and Affordable Care Act (ACA). There are a couple of ways to think about this $2 billion sticker price, both of which are highlighted in the following chart. First, the state’s two-year, $2 billion cost for ACA-related enrollment in Medi-Cal pales in comparison to the federal government’s contribution over the same two-year period: $32 billion. These federal dollars — which are just a portion of total federal funding for Medi-Cal — flow to doctors, clinics, and other health care providers in communities throughout the state, boosting local economies and supporting vital health care services for millions of low-income Californians. A shift — back to the state — of certain dollars previously provided to counties for indigent health care, resulting in projected General Fund savings of $1.4 billion over two years. The use of some proceeds from a tax on Medi-Cal managed care plans to offset state spending, resulting in ACA-related General Fund savings of more than $800 million over two years. In short, these two policies — which are described in more detail in our previous blog post — result in state savings that exceed California’s cost for Medi-Cal enrollees who have signed up due to health care reform. So, the next time you hear that health care reform has dramatically driven up state spending for Medi-Cal, follow the same rules that apply on the used-car lot: ignore the sticker price and focus instead on the actual rock-bottom cost. Medi-Cal — the Medicaid Program in our state — provides health care coverage for millions of low-income Californians, primarily children, youth, and women. Last year, state policymakers approved expanding Medi-Cal — as authorized by federal health care reform — to extend coverage to more than 1 million low-income adults who had not previously been eligible for the program and made other changes intended to increase enrollment. A new CBP analysis — the latest in a series of briefs on key components of Governor Brown’s proposed 2014-15 budget — looks at the Medi-Cal Program. 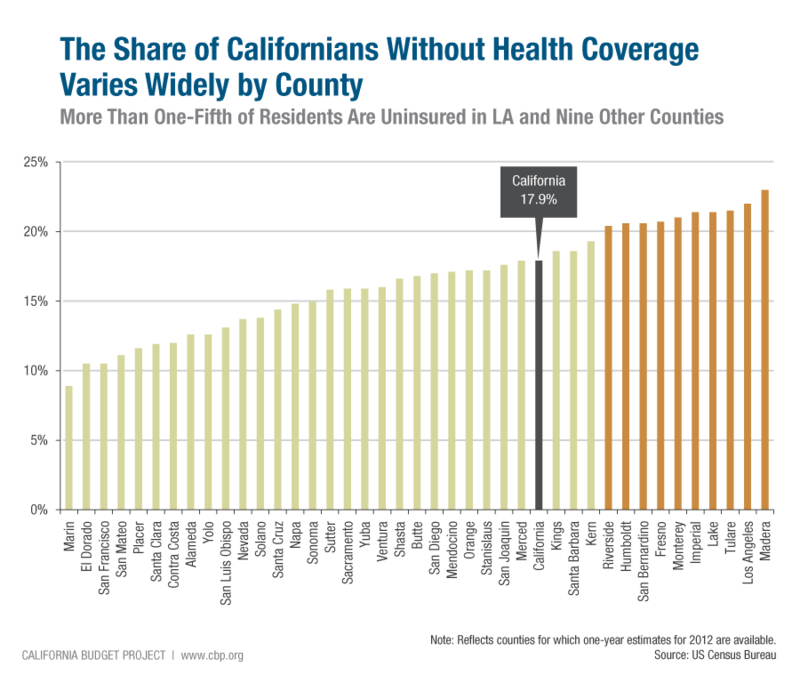 This brief shows that 1.5 million Californians are projected to enroll in the program due to implementation of health care reform, bringing total Medi-Cal enrollment to slightly more than 10 million. 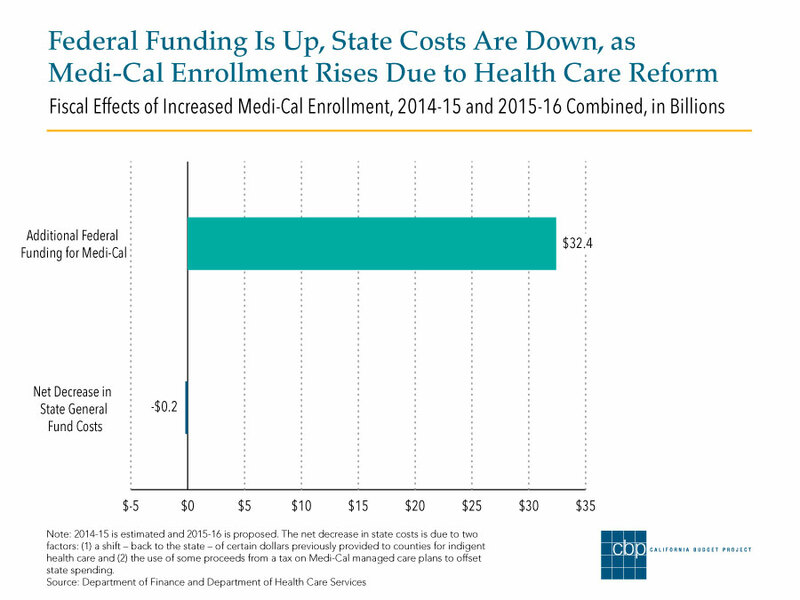 This boost in enrollment is projected to increase federal funding for Medi-Cal by more than $10 billion through June 2015. At the same time, however, the Governor’s proposed budget largely maintains a 10 percent cut to Medi-Cal payments for doctors, dentists, and other providers, which could hinder enrollees’ access to care. This CBP brief on Medi-Cal in the Governor’s budget proposal can be found — along with the full series of briefs, which covers education, human services, corrections, and other topics — on our website.